Between my Android tablet and my Android phone, I've been creating a lot more content on the go than I may ever have expected to. Between pictures and notes captured on my Thunderbolt, and the occasional article hammered out on my Iconia, There's pretty much always something on my mobile devices that I'd like to grab from my PC. Dooblou WiFi File Explorer handles this task beautifully. Before I discovered wireless file explorers like this, I used to deal with file transfers from my phone in one of two ways: I'd either put the file in Dropbox or connect with a USB cable. Dealing with cables is a pain that no 21st-century person should have to endure, and Dropbox seems like an inefficient solution for handling the transfer of one or two files. 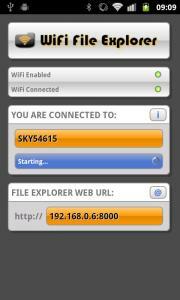 WiFi File Explorer uses your Android device's Wi-Fi connection to join your wireless network, then creates a little Web server on your network that lets you browse your files from any other computer on the network. So you just go to your PC, type the IP address and port number the app gives you, such as 192.168.1.77:8000, and then you'll see a list of your phone's files and folders in your browser window. The app includes a password protection option, which should probably be enabled by default, but isn't. I'd suggest enabling it on first use. In addition to just copying files, you can stream music and video from your device. The pro version, which costs less than two bucks, adds the ability to create new directories on your phone, download multiple files from the device simultaneously, download whole directories, stream media playlists, backup your entire device, and more. Of course, WiFi File Explorer is by no means the only wireless file sharing tool for Android devices, but it might be the simplest, and for that, it gets my productivity-minded thumbs-up.